Russia as the largest country in the world provides many kinds of foods. It has the distinct ingredients and form which can be identified once you taste the foods. Not only delicious, but the natural ingredients that used is very important for your health. Since they tends to relies on naturally grown ingredients, which is easy to find around the yard. Just as Italian where is famous for being a country of delicious pizza, Russia also well known for producing a number of national dishes. It features Russian vegetables, mushrooms, potatoes, cucumbers, berries, and filled with sour cream and mayo. Below are lists of well-known foods that were produced in Russia. 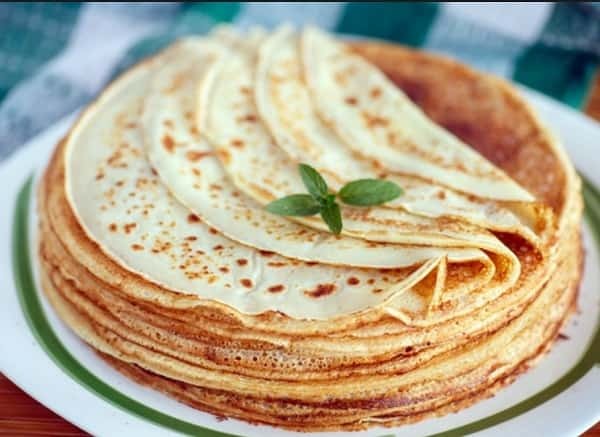 Blini in Russia is mostly like crepes for French people or the American people with their pancakes. The shape is exactly the same, round and very thin which is batter cooked the same as pancakes. Blinis are usually served with the additional filling. The filling can be anything based on your personal preferences to provide your great taste. They can be fruit, jam, honey, jelly, cheese, meat, fish, salad or event caviar. This blinis are very popular to serve in every occasion, from dessert, family dinner and special events such as New Year’s Eve and Christmas. Pelmeni is actually a dumpling made from flour and water dough with eggs filled with minced meat –pork, lamb, beef, fish or any kind of meat you want- then it is formed like a ear-shaped. This cuisine was originally produced in Siberia. And nowadays it has became well known all over Russia and even the worldwide. The way of cooked is the same, but the serving might be different based on your own preferences. For some Russians, they usually dip pelmeni in a melted butter or in a sour cream. Once you mention about pelmeni, the first thing they recognized was Russian dumpling dish. The best thing in Russia is you can find any kinds of soups. Russian really loves soup, it is a must dish in every meals. They can make soups with the various ingredients, like beets, potatoes, cabbages, fishes, chickens, etc. Among all kinds of soups, the most popular and most well-known is borsch beet soup. Its recipe might be different based on which region it comes, which make the taste is rich. Salads in Russia are not barely the same as the salad from western like American have. The thing to differentiate is the use of more ingredients than the common salad made from lettuce and simple dressing. Besides the use of many different chopped ingredients, the main distinct point that makes it unique is the adding of mayonnaise. So, the recipes are simple actually, prepare the ingredients that you want, like ham, cheese, carrots, garlic, cabbage, pickles, peas and don’t forget the mayo. After you chopped all the ingredients in a small sized, put in a large bowl and mix all ingredients together with the mayo. And it’s ready to eat, add more mayonnaise if you like. You will be amazed with this one of well-known foods that were only produced in Russia. Talking about Russian ikonic beverages, we must all familiar with Vodka. One of the well-known beverages produced in Russia. In every occasion, or gathering, Russian always has vodka to accompany their mostly cold time, along with the snacks or the heavy meals. But actually, they have a numerous kind of national drinks as well. Besides the alcoholic beverages, Russian also drink tea, coffee and healthy juice. One unique and famous beverage that was produced in Russia is called Kvas. It is a drink made from fermented bread. The taste is sour, and usually served to accompany you in a hot day. At first you might have to prepare your stomach since it is very sour. In fact, it is very popular in Russia and the countries of Eastern Europe such as Ukraine, Belarus, Poland, Czech and Latvia. Another Russian drink with non-alcohol contains is Mors. This traditional drink is made from boiled berries –lingonberry, cranberry, blueberry, strawberry or raspberry and sugar also water. As for dessert, Russian is famous with the chocolates, cakes and pastries. There are many stores that provide wide range of sweets in all over Russia. Besides, Russian really appreciate the festive holidays, at that certain times they usually takes and gives presents with any forms, fillings and different flavours. One of the most well-known bread produced by babushka in Russia is called Kulich. You can find this dessert especially in Easter celebration. It is baked in tall, cylindrical tins- like coffee or fruit juice tins, and then is decorated with white icing and beautiful flowers. You might find the similar bread in Italia which is named panettone. The last well known food that was produced in Russia and also belongs to most unusual dish is called Kholodetc. The name itself means cold in Russian language. The similar dish in America was called as aspic. People usually served this interesting dish in a holiday. The main ingredients of making kholodets can be pork or beef, fish, or even chicken then it is added with garlic. The way to make is long, because after boiling the meat with garlic, you still have to wait until the meat is completely cooked, then you can’t directly eat as it still hot. The next step is put it in the refrigerator until the broth is hardens into a gel. Then finally you can serve the delicious kholodets along with spicy horseradish mustard sauce and accompanied by cold vodka. This well-known dish is loved by Russians, besides delicious this dish is also healthy. The unique way to enjoy eating meat, you must try this.